Stocks suffered their largest one-day loss of the year as global growth fears accelerated after manufacturing data was released on Friday. We had two main events this week: the FOMC meeting on Wednesday and the preliminary (also called "flash") PMIs Friday morning. In addition, to those we had some bad earnings releases from Nike, Fedex, and Micron helping drive down the narrative. On the week, the S&P 500 fell just over 1% while small caps fared the worst losing over 3%. Bond indices did well thanks to those falling rates. The Agg was up 0.87%, while high yield was up 26 bps. Munis did well rising 67 bps. REITs and utilities did the best on the week. The 10-yr ended the week at 2.44%, the lowest level this year and down significantly from last Friday's 2.58%. Oil did not move much on the week ending around $59 a barrel. But the VIX spiked on Friday to 16.8 from a 12-handle on Wednesday. The Fed meeting on Wednesday had Chairman Jay Powell dialing back the rate hike outlook to zero for 2019. This was down from two hikes expected in the December release. The committee now sees only one hike over the next three years while the market is now pricing in a small cut next year. More below on the Fed's dovish stance. Europe continues to look sickly. The German manufacturing sector ("PMI") sparked the sell-off as their initial reading hit a 6-year low of 44.7 (anything below 50 is a contraction). The Eurozone as a whole is still above 50 at 51.3, but that reading was below forecast. Lastly, we had some terrible earnings releases from Fedex, Nike, and Micron which exacerbated the negative sentiment. Fedex, an economic bellwether, fell far short of expectations and cut guidance (again). Micron also issued light guidance but the shares rose on the news. Nike's report was not bad but spoke to some larger global weakness. In reaction to the news, global bond yields plummeted with the 10-yr German bund reaching negative territory for the first time in nearly 3 years. The terms "recession" and "yield curve" saw some of the largest searched trends on Google on Friday as a recession indicator was triggered. The 10s-3m curve (10yr yield minus the 3-month t-bill yield) went negative on Friday thanks to global growth concerns and falling yields globally. This likely exacerbated the decline in the markets. When it inverts, investors believe there is a recession coming relatively soon. The last time the curve inverted was in 2007, near the peak of the market prior to the global financial crisis. Typically, a recession comes 12-18 months following an inversion. What is important and often failed to be mentioned in the media is that the curve needs to stay inverted for a full quarter- not just hit for a day or few days. So technically, we are not there yet. We will keep watching. As of yet, there were no signs of panic in the credit market. This is a good thing as it could be more algo/sentiment driven market movement in the equity indices. As we've been saying, this is late cycle but it is unlikely that the bull market ended on Friday. We were just a few points from all-time highs going into last week. It is likely we make another run for them soon. The key factor is not what is happening here (in the U.S.) but in China and Europe. Chinese growth is an important domino that could either propel us to new highs or drag down US (and European) growth further. FT Sr Floating Rate (FCT): Monthly distribution increased 4.2% to $0.0625 from $0.06. Highland Floating Rate Opp (HFRO) is changing its name to Highland Income Fund (HFRO). The cusip and ticker will remain the same. The policy change simply removes the old requirement of having 80% of net assets invested in floating rate loans. (III) other instruments, including but not limited to secured and unsecured fixed-rate loans and corporate bonds, distressed securities, mezzanine securities, structured products (including but not limited to mortgage-backed securities, collateralized loan obligations and asset-backed securities), convertible and preferred securities, equities (public and private), and futures and options. Once effective, the Fund will no longer be required to invest at least 80% of its assets in floating-rate loans and other securities deemed to be floating-rate investments. Highland Capital Management Fund Advisors, L.P., the Fund's investment adviser (the "Adviser"), believes the change will expand the Fund's universe of opportunistic investments and provide additional flexibility when investing outside of floating-rate instruments. Until the effective date, the Fund will continue to invest in accordance with the 80% Policy. Once the changes take place, the Adviser still expects to invest a significant portion of the Fund's portfolio in floating-rate securities. The Fed announced that they are essentially done in this cycle- for the time being- both in raising rates and in reducing the balance sheet. The Fed Funds curve is now flat and even assumes a very slight cut through 2020. That means it's better for the market that the Fed will not act for the next two years. Any CEF investor must incorporate the current and anticipated interest rate environment when assessing where to allocate capital. One thing we looked at this week is the possibility of raising 'sell threshold' figures on the Google Sheet to incorporate the new benign rate environment. It is clear that the previously established thresholds were built under a different paradigm. Other things we will be looking at is the allocation to floating rate. While it has helped us the last few months given how oversold it was in December/January, I do think it is time to consider reducing that allocation. If you want to maintain exposure to securities with a lower duration, then look at hedged fixed income strategies and high yield alternatives instead. Some that come to mind at PPT, ISD, and PIMCO twins. Muni CEFs and non-agencies in the mortgage sector continue to be the best positioned in this current environment given the falling rates and inverted curve. Munis especially are attractive and continue to provide a natural hedge to the market moves. While we do not see a substantial leg lower in the near-term, the inverted curve and the slowing global economy does increase the likelihood. Below are some one-day changes in NAVs for different funds. You can see why we focus on the MBS funds. While PCI and PDI saw NAVs decline a bit, largely because of the exposure to high yield, the heavier MBS open-end mutual funds were either flat or up on the day. The last two securities on the list (HYG and MBB) show the differing performance of the sectors on Friday. High yield, which has been performing well, lost 36 bps on the day while MBB, a mortgage focused ETF, was up 33 bps. That helps drive the NAVs of the open end funds like PTIAX (+31 bps), IOFIX (+8 bps), and CLMFX (+40 bps). This continues to be an area we like. Unfortunately in the CEF space, there aren't many cheaper options so we've been using open-end funds. Watch JMT/JLS for a better opportunity to get in. Remember, these funds are merging and becoming perpetual trusts with a 100% tender offer. Any discount greater than 1% is a buy for me. PIMCO released their monthly UNII and earnings report on Thursday after the close. The big news from it was the revision to the four prior months for both PCI and PDI. This was not a huge deal as it looks like PIMCO essentially, starting in October, reversed the data points for (PCI) and (PDI). In other words, the PDI data was placed in the PCI field starting in October and vice versa. The table below lays it all out. The $1.06 net investment income number for PCI prior to the revision was the PDI number for October. PCI's NII should have been $0.87. The same mistake was made for both coverage ratio and UNII. This appears to be more of a data entry error rather than an accounting error. PIMCO muni CEFs continue to shed valuable UNII. PCQ (CA Muni) lost another two cents of UNII in February for the second straight month. At this rate, it will exhaust its UNII balance in 18 months. PML, the other high UNII fund, lost 1 cent. PNF and PYN, both NY muni CEFs, each lost a penny too. Average UNII across all funds fell by one cent to 8 cents. Overall, coverages were down a bit with the average muni CEF ratio at 91.1% compared to 93.2% in January. Still, the 3-month stacks (February 3-month coverage ratio versus November's 3-month coverage ratio) are nicely positive, in many cases double-digits. The coverage ratios and UNII levels for the taxables aren't very valuable given the unrealized gains are not incorporated into net investment income until realized. For the muni CEFs, they are more valuable. For the taxables, as I've said a hundred times, I like to look at NAV changes for indications into distribution health. Valuation is clearly another story. The premium on PDI seems more warranted today than it was a month or two ago given the Fed's pivot. Still, the NAVs have struggled as of late. I like to look at trailing 30 day periods for clues as to NAV performance. For example, for PDI the NAV was $27.76, about $0.10 cents above where it stands today. This during a time of mostly improving credit spreads. But during the prior 30-day period, the NAV increased by $0.22. And the 30-day period before that, by $0.30. So clearly the rate of change (second derivative) is slowing. A key indicator for us would be it going negative for several 30-day periods. Some of the other taxable CEFs look weak on the tax UNII report including PKO. But the NAV is still positive over the last 30 day period and is comfortably positive over the YTD period with $0.59 of growth. Roughly the same dynamic is occurring with PFN and PFL, which both still have nice cushions on NAV YTD growth. Still, I probably wouldn't be adding to any PIMCO CEF here. And I looked back and haven't purchased any shares in almost three months. There's still a possibility that the market will see this report and sell on it providing another entry opportunity. But that is looking less and less likely as time passes. The PIMCOs taxables do tend to sell off around ex-distribution dates (around the 8th-12th of each month). In terms of the 'buy under' and 'sell over' figures for the PIMCOs, we will likely do some minor adjusting to incorporate the new interest rate environment. Stocks again moved higher for the longest weekly gains in nearly 25 years. Materials and utilities were the leading sectors. The S&P was up 0.65% with the Nasdaq up 0.74%. Small caps rose by 1.34%. For the year, the S&P 500 is now up 11.74% and the Russell 2000 is up 18.08%. In fixed income the Barclay's AGG rose another 11 bps and is up 1.21% on the year while high yield gained another 35 bps to 5.89% on the year. Munis were also up on the week approximately 16 bps and are now up 1.21% YTD. Interest rates continue to hold in a tight range between 2.65% and 2.72%. We still do expect them to break out on the higher side. Of course, with the market zooming and due for at least a period of consolidation if not a small pullback, there is a shorter-term risk to that forecast. Oil was up another $2.50 on the week and hit $58 briefly Thursday before pulling back a little. Meanwhile, the all-important VIX fell to a 13-handle on Thursday but rose slightly to 14 by the close on Friday. That is down from 15.6 at the end of last week. The key news on the week was the progress being made on the trade front with President Trump stating that the March 1st deadline was flexible as they near a deal. We also got the Fed minutes this week for the January meeting which stated that all participants thought it was a good idea to stop reducing the balance sheet later this year. Officials also noted that they favored a patient approach to monetary policy that would allow them to monitor the data. SPX macro update – US equities headed for a period of digestion but the SPX should stay within 2750-2800 - the bar to impress the SPX is much higher than it was back in H2:Dec and H1:Jan and thus the index could struggle for the time being. At this point it would take the instant removal of existing US-China tariffs, a sharp upward inflection in Chinese growth, and ending reserves on the Fed balance sheet of ~$1.3T to “surprise” US investors on the upside. The 2019 SPX EPS consensus remains ~$172.50 (on Thomson Reuters) and the present PE isn’t ridiculous (16.1x) but it isn’t extremely cheap either. Positioning/sentiment are still tailwinds but not nearly to the extent they were a few months ago. The SPX will likely break up through 2800 by the summer but the path forward won’t be as linear as it was since 12/26 and a trip back towards ~2750 could easily occur during the upcoming period of digestion. • The ingredients for a break in the SPX above 2800 – the following macro developments need to occur to get the SPX north of 2800: 1) the Fed confirms plans to complete balance sheet normalization by the end of 2019 and commits to keeping reserves at $1.25T or more; 2) the Fed more explicitly signals the end of rate hikes (this has been strongly suggested but the recent minutes left the door open to additional tightening actions); 3) the ECB delivers on the market’s LTRO expectations; 4) Chinese growth continues to stabilize and inflects higher; 5) the US and China reach a trade compromise and Trump avoids other trade-related battles (in particular, Trump backs away from his auto threats); and 6) US growth momentum doesn’t decelerate dramatically. Bottom Line: this scenario is likely to occur but it may not be apparent for a few more weeks and thus the SPX will likely tread water for the time being. We still continue to believe that at least one rate hike is likely this year - probably at the June meeting. But it will be highly dependent on the market expectations. Chairman Powell learned his lesson about going against market sentiment when raising rates. From a technical perspective, the market continues to break out and approach new highs but I do fear a 'sell the news' rally should we get a deal with China. In addition, earnings will be fairly flat this year which should prevent a large multiple expansion in the index capping the upside from here a bit. Western Asset High Income Opp (HIO): Monthly distribution increased by 9.4% to $0.029 from $0.0265. Gabelli Health & Wellness (GRX) increased their quarterly distribution by 7.7% to $0.14 from $0.13. Western Asset Global High Income (NYSE:EHI): Monthly distribution increased by 1.6% to $0.062 from $0.061. Western Asset High Income II (HIX): Monthly distribution increased by 1.1% to $0.046 from $0.0455. First Trust Sr Floating Rate 2022 Target (FIV): Monthly distribution decreased by 15.4% to $0.0353 from $0.0417. Wells Fargo Global Div Opp (EOD): Quarterly distribution decreased by 3.5% to $0.14881 from $0.15413. Special Opportunities Fund (SPE): Shaker Financial is building a position and now owns 5.02% of the shares. High Income Securities (PCF): This formerly Putnam run fund has Karpus owning 9.5% of the shares. The hedge fund is building positions in Aberdeen Emerging Market Equity (AEF) where they own 7.5% of the shares. Aberdeen Total Dynamic Div (AOD)- 8.24% of shares, Aberdeen Japan Equity (JEQ)- 21.15%. Korea Fund (KF) - 9.2%. Blackrock Enhanced Global Div (BOE) - 5.51%. European Equity Fund (EEA) - 20.3%. D&P Utilities (DUC) - 5.07%. First Trust Dynamic Euro (FDEU) - 5.01%. EV Short Duration (EVG) - 5.64%. JH Investors (JHI) - 8.2%. JH Income Sec (JHS) - 6.26%. MFS Ind Income (MIN) - 8.95%. MFS Emerging Market (MSF) - 7.58%. Building positions in D&P Utility Corp (DUC) - 14.6%. EV CA Muni Income (CEV) - 6.35%. EV Muni Bond (EIM) - 10.4%. EV NY Muni (ENX) - 5.9%. Aberdeen Global Opp (FAM) - 12.4%. Gabelli Health and Wellness (GRX) - 5.6%. High Income Securities (PCF) - 9.4%. JH Tax-Adv Global (HTY) - 11.9%. Western Muni High Income (MHF) - 5.9%. Nuveen AMT-Free Quality (NEA) - 5.2%. Nuveen NY AMT- Quality (NRK) - 8.1%. Nuveen NY Muni Val (NYV) - 7.1%. Pioneer Div High Income (HNW) - 7.3%. Prudential Global Sh Duration HYY (GHY) - 5.75%. Senior loans (a.k.a Floaters) finally saw some material discount closing this past week. Most of that came on Thursday and Friday as prices jumped over 1% in many cases. The driver for it is unclear. It could be that it was the last bastion of value in the bond space of the CEF market. Or perhaps sentiment is shifting a bit given the rebound in the equity markets that another rate hike (or more) is back on the table. We will be issuing a separate report in the next day or so in the floating rate space with some top trades. I'll try to get it out as soon as possible. We would just note that it pays to be patient when holding these securities. The Leveraged Loan Index still sits at or just below $97 so there's an opportunity for more NAV gains, in addition to the pricing gains we've seen this past week. If you look at the sector list in the statistics section, you can see that while senior loan NAVs rose about 54 bps, prices rose by 250 bps, closing the average discount by 2 points. We now have many funds that are under a 'sell flag' for the first time in over 7 months. This is not unusual given the sentiment driven nature of the closed-end fund space. At various times, we have a dearth of buyers that can send prices plummeting and discounts widening (December is a great example). At other times, there are no sellers and even a marginal amount of new money can send prices higher and discounts tighter. Investors need to make a choice here if they want to continue to collect income and hold, or sell and move into something else while waiting for better valuations. The problem with the latter, which is more of a total return approach, is it can take months if not longer for those valuations to present themselves. We noted on the chat that members are susceptible to some groupthink and to be careful you do not become too conservative. Many members are selling and raising large amounts of cash. If that is part of your overall portfolio plan, then so be it. But do not stray far from your target allocations just because we rebounded to where we were in late September (or near it). Funds can continue to see increasing demand and rising values for a long period of time. In 2016 and 2017, we saw very little volatility and 'cheapness' after nearly two years of it prior (2014-to-early 2016). In other words, after what was a painful quarter, we could be done with the pain for a while. Obviously it is impossible to know that. Just a word of caution. While I continue to trim our holdings a bit, each needs to consider what is their personal situation. Are you retired? Are you in accumulation mode? Are you drawing on the portfolio? How risk averse are you? What is the need for yield like? If that yield were cut in half, what would happen? I sit on about 15% cash (just a hair above the long-term average I have typically held). This past week I sold IHTA, HYI, a small amount of VPV, PCI, and PDI. I did add to TSLF, DHY, LOR, and PPT. Nuveen released their January numbers on Friday. The muni side showed a continuation of prior trends with some UNII build and coverage improvement. Remember, Nuveen cut their muni CEF distributions significantly over the last year-plus in an effort to stem the 'call problem' and rebuild UNII. That appears to be working well. The top coverage on the national muni side is (NMZ) which increased coverage to 108.1%, up 2 points from last month. UNII also continues to increase and is now at 2.7 cents, up from 2.2 last month and a negative reading back in August of last year. It remains our top pick. Other funds that are doing well from a fundamental standpoint are NAD, NIM and NXC (CA muni). That doesn't mean they are cheap by any means. PIMCO Enhanced Short Maturity Active ETF (MINT) is our preferred cash-substitute. That does not mean it is pure cash or as safe as cash but it exhibits "cash like" characteristics in terms of volatility and credit risks. I think the best way to demonstrate the risks are through a series of charts related to performance. The first is the total return in price from the market peak in late September through the trough on Christmas Eve. You can see for most of the downturn, MINT was rising in value. The fund peaked in mid-November and then rolled over in December. But the y-axis (right side) shows you the level of volatility. The fund went from a +0.24% increase and fell back to +0.18% for a difference of just 6 bps. Here we compare it to the 1-3 month T-Bill ETF (BIL). You can see that BIL showed no volatility - since its a treasury bill that has zero risk of default. MINTs underlying securities do have some risk of default, small as it may be (hence the 6 bps move and not 60 or 600 bps). Credit spreads widened during December which will have an effect on ALL non-risk free securities. Now let's look at how the fund did over the last year. There's a spread of 41 bps compared to the risk-free rate. The top holding is pure cash at 16% of the fund. Quality is not the same as pure cash but it is high quality. MINT is not something that is risk-free but on the spectrum of possibilities for investment, it is very close to something that is ultra-safe. We continue to add to it given the nice 3%+ yield and the high amount of liquidity. I like MINT better than GSY because the distribution is more stable (slowly rising) whereas GSY jumps around a lot. For the 8th consecutive week in a row, U.S. equity indexes posted gains as optimism spread that a trade deal would emerge with China. More importantly, crude oil increased over 5% to over $55 on the week helping energy stocks. Largely underplayed by the media, we also got hints that the Fed will end the balance sheet runoff sometime this year. Economic growth figures from China were also stronger than expected but that was offset by the very weak retail sales numbers for December here. Those figures have chopped almost a half a percentage point off GDP estimates due out in two weeks. Lastly, the budget resolution appears to be over avoiding another government shutdown. President Trump will call for a national emergency to fund the border wall. It will spend the next several years in the courts and likely not get done. The VIX ended the week below 15 for the first time since September which bodes well for the risk on strategy. The ten-year yield finished the week at 2.66% and continues to trade in a tight range between 2.65% and 2.72%. I do still think the bias is to the upside from here and that we may see a little catch up move in the next few weeks. Fourth quarter earnings season is now three-quarters done and shows earnings growth of 13.1% yoy with revenues increasing 7%. Estimates for the first quarter continue to come down and now show a decline around 2.5%. US equity macro outlook – the risks of a move >2800 in the SPX are building. The SPX has sprinted ~400 points (or 17%) off the 12/26 low for a variety of reasons, including the Fed pivot, better-than feared/expected earnings, growing anticipation of a US-China trade settlement, stabilizing China growth (thanks to aggressive gov’t stimulus), aversion of another US gov’t shutdown, etc. Based on present fundamentals (including a $172-173 SPX 2019 EPS consensus range) it’s hard to justify a PE much beyond 16x (which corresponds to ~2750). But, the tape still has a technical tailwind in the form of negative sentiment and light positioning and this can easily push the index toward ~2800 (which would represent ~16.2x). While the present landscape puts the SPX at 2750-2800, the risks for a move beyond 2800 are building. If Brainard’s balance sheet remarks were to be codified formally in the Fed guidance (which could occur at the March FOMC meeting), if the ECB delivers on the market’s LTRO expectations (which seems very likely), if Chinese growth can continue stabilizing and inflect higher (the stabilization part is occurring), if stabilizing Chinese growth can translate into improved Eurozone economic momentum (unclear), if US growth can stay on a healthy trajectory (this seems likely, notwithstanding this week’s retail sales report), if the US and China can reach a trade agreement (this seems very likely), and if Trump can avoid escalating trade tensions away from China (this also seems very likely), the SPX could easily surpass 2800. Lastly, I haven't showed the 10s-2s spread in quite some time. The difference between the yield on the 10-year bond and the 2-year note is 14 bps. The trend is no longer down and has meandered around 10-20 bps for four months now. With the two-year likely subdued from the notion that the Fed is done, and the 10-year likely to inch higher, the spread could widen back out to the mid-twenties soon. We are back to happy days again where no amount of bad news can derail the market. The S&P is now squarely above the 200-day moving average (with room to spare). The 400+ point increase on Friday could be the catalyst needed to get to the next level and possibly break out towards the September highs. The V-shaped recovery is nearly complete and we are less than 170 points away from the all-time high on the S&P. The market severely punished those that abandoned ship in December and significantly rewarded those that held on or even doubled-down. I don't really see anything from a technical perspective stopping it though the market does appear overbought. My one concern is the ECRI Weekly Leading Index (WLI) that I follow has been declining. But that is a fundamental index and this is largely a technical-driven market. With earnings likely going into an earnings recession. I've been slowly de-risking and raising cash again. With another bout of selling on Friday, I ended the week with over 15% cash and will continue to add to it. On top of that there's another 5% of CEF positions that I rolled into PONAX as a placeholder until better CEF opportunities arise. Tekla Healthcare Investors (HQH) decreased the quarterly payout by 19.6% to $0.41 from $0.51. Apollo Tactical Income (AIF): Advisors Asset Management added to AIF and now owns 7% of the shares outstanding. Special Opportunities Fund (SPE): Relative Value Partners owns 1.96 million shares or 23.1% of shares. Barings Corporate Investors (MCI): Mass Mutual Life owns 2.01 million shares, approx 10% of the outstanding shares, a 6% increase. Renn Fund (RCG): The fund announced the results of the non-transferable rights offering to holders on Feb 8th. The aggregate gross proceeds were $2.2 million, the maximum allowed under the offering. Shareholders submitted subscriptions for 166% of the permitted subscriptions. As a result, the number of shares sold pursuant to oversubscription privileges to shareholders who exercised their oversubscription privileges was prorated according to the terms described in the offering prospectus. Furthermore, since the offering was over-subscribed, no shares will be purchased in connection with the backstop agreement between Horizon and the Fund. The Fund sold an aggregate of 1,487,989 shares of common stock at a purchase price of $1.47 per share. The shares of common stock are expected to be distributed to participants through the Fund’s transfer agent or through the clearing systems of the Depository Trust Company commencing February 12, 2019. Following this offering, the Fund will have 5,951,956 common shares outstanding. China Fund (CHN): The fund's tender offer expired on the 5th of Feb and accepted 4.71 million shares for payment on Feb 12th at $20.61, equal to 99% of the fund's NAV. The Fund will make prompt payment to participating stockholders of the Purchase Price for Shares accepted in the tender offer. The 4,716,803 Shares represent 30% of the Fund's outstanding Shares as of January 4, 2019. A total of approximately 11,586,494 Shares were properly tendered and not withdrawn by February 5, 2019, the final date for withdrawals. Therefore, on a pro rata basis, approximately 40.71% of the Shares so tendered have been accepted for payment. Highland Global Allocation (HGLB): Highland Capital Management decided to conver its open-end fund, a series of the Highland Funds II, into a closed-end fund. Conversion was approved back in early November. As a result of the Conversion, the Fund will effect a reverse stock split of Class A, Class C and Class Y shares of the Fund and will combine such shares into a single class of common shares under the CUSIP 43010T104 with an initial net asset value of $15.00 per share. Conversion ratios will be available on February 14, 2019. Shareholders will not receive fractional shares because of the Conversion, but instead will receive a number of shares, rounded down to a whole number. Shareholders will receive a cash-in-lieu check related to the fractional portion of their shares shortly after the Conversion. The shares will be listed under the ticker "HGLB" and at an initial listing price of $15.00. Any shareholder seeking to move shares to a brokerage account will need an adviser or broker dealer to transfer the shares through the Depository Trust Company's ("DTC") Profile System. Shares of the Fund are DTC Eligible. 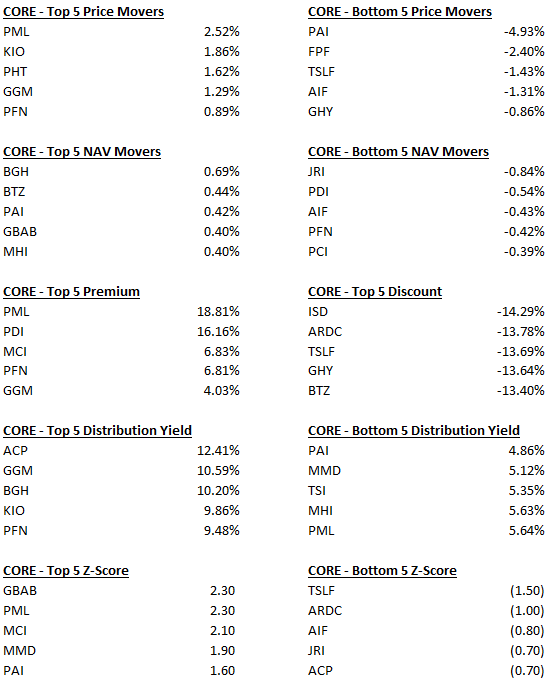 First, the stats on the Core funds showing the top and bottom 5 price movers, NAV movers, highest premiums, largest discounts, highest and lowest yields, and z-scores. We extend that to all ~580 closed-end funds and show the same statistics across the entire CEF space. Discounts continued their tightening trend this past week and now are clearly near 52-week averages. For instance, below is the discount of the multisector bond index from CEFAdvisors. The current premium level of the index is 4.82%, close to the levels reached in late September. Using the prior highs as a benchmark, we have another 1.2 points to go. We have moved over 10 points above the lows set near Christmas. This shows us clearly on the expensive side of valuations of the last year. The easy money has been made. The S&P Leveraged Loan Index is still well below par at $96.85. At these levels, there is still a decent implied default rate. One of the most attractive funds right now is the THL Credit Senior Loan (TSLF). At a -12.7% discount, it is still 3.5 points away from its 52-week average. The fund yields nearly 8% and just raised its distribution two months ago (albeit slightly). From a NAV basis, it is up 2.7% YTD after eeking out a fractional gain last year. For those that own the Tekla Healthcare CEFs (HQL)(HQH), the distribution cut should not be a surprise. Whenever these equity funds have a managed distribution policy as a percentage of NAV, the movement in the NAV will dictate the next distribution. With a sharp decline in the fourth quarter, it was assured that they would lower the distribution for March. They have a policy to distribute 2% of NAV each quarter so simply take the December 31st NAV and multiply by 2%. We talked about hedging last November and that the optimal time would be when the VIX is below 15 and HY spreads back below 3.5%. We have one of those criteria finally met with the VIX with a 14-handle. HY spreads, however, are still above 4% at 4.17% (as of Feb 14th) and slowly coming down. I have to imagine we took off another few bps on Friday given the market move. You can see the HYG (iShares IBoxx High Yield Bond ETF) is nearly back to the early October levels. Hedging using options is now relatively cheap again. Using HYG put options, you can hedge for the rest of the year for approximately $8,500 of portfolio value for about $200-$300. We screen the taxable bond space each week for the funds the exhibit what we believe are undervalued characteristics. That is, a higher yield supported by the financials, a larger discount than average, and a low z-score compared to other funds (very similar to the Power Rankings Report). The top scoring fund was John Hancock Investors Trust (JHI) which yields 8.21%, a discount of 10.6% (compared to an average of 8.1%) and a one-year Z-score of -1.60. The fund straddles the investment grade and non-investment grade space with 23% BBB (investment grade), 30% BB (non-investment grade), and 28% B (non-investment grade). Be warned that CEFConnect places it in the "investment grade" category even though only one-quarter of the fund is IG. There are two negatives on the fund: it pays quarterly and has very low trading volume. The fund is now good for larger accounts with only 20K shares traded each day. Rule of thumb: never own more than one-quarter of the daily trading volume. Still, the NAV is nicely rising and the price flat creating a good setup. A better candidate for those with larger accounts would be Credit Suisse High Yield Bond (DHY) which trades over 300K share per day. We are moving down the credit spectrum a bit with 35% BB, 37% B, and 20% in CCC. Compared to JHI, we've moved down about one rung in quality. Still, the yield is nearly 9.7%, so we are being compensated. One final note: There is a wealth of information in the statistics section and we study it vigorously each week but that doesn't mean we catch everything. If you think you see an opportunity- both to buy or to sell- comment below! Stocks managed to eek out another weekly gain last week, the seventh consecutive as the bear market of the fourth quarter seems like a distant memory. Energy lagged while utilities and industrials outperformed. For us, the important points to highlight first and foremost is the VIX which hit a 5-month low on Wednesday before inching higher the rest of the week. At 15.7, the index is less than half what it was during the week of Christmas. Global growth concerns remain the most pressing risk the market is facing. Last week, Eurozone policymakers cut their economic growth forecasts to a 1.3% annual rate in 2019, down from 1.9%. The bulk of the slowdown is being blamed on slowing Chinese demand for their products. We have also been fading the trade deal optimism in the last couple of weeks as news came a few days ago that President Trump and President Xi will not meet when Trump visits Asia later this month. Nonetheless, top trade officials including Lighthizer and Treasury Secretary Mnuchin are flying to Beijing this week to continue talks. Lastly, the Fed Chief Powell said this week that the economy is "in a good place". We received ISM services data last week that while still at a high level, did slow for the second consecutive month. Powell had dinner with Trump at the White House where they discussed recent economic developments and forecasts. Some other key news during the week was a federal judge approving the restructuring of $17B of bonds backed by Puerto Rico Urgent Interest Fund Corporation, known as COFINA. Bondholders agreed to a deal that would split revenues from the sales-tax backed debt and the government. It was one of the largest deals done so far in the Puerto Rican bankruptcy process. PR muni bonds rallied on the news. Nothing has changed from the narrative of the last few weeks. We still have the trade overhang, the government shutdown looming, and global growth slowing as the major risk impediments. The market doesn't seem to be too phased by them. The major trends in the market are in place and incremental news on any of those three subjects can move it but not de-rail the trend. High yield bond spreads are still elevated above the post-recession lows. The index sits at 429 bps as of last Thursday (Friday's data isn't posted yet). This is still ~90 bps above the 3.35% registered in September. As the VIX cools and the risk-on sentiment in corporate bonds continues, the spread should continue to inch lower. That should be supportive of bond CEF NAVs across or portfolios. The same could be said of the investment grade option adjusted spread which sits at 134 bps, well above the levels set in early 2018 when it reached just 90 bps. US equity outlook – the SPX is consolidating and digesting but the rally isn’t over just yet (although the upside potential isn’t dramatic). ~$172-173 (EPS) and 16x (PE) are still reasonable numbers and they support the SPX at ~2750 (investors should be wary of chasing beyond 16x/~2750 but given how emotional this market can get, an overshoot could easily occur and ~16.5x would put the index at ~2800). Investors have plenty to be nervous about (including the ongoing growth softness in Europe and the risk this drags the other major geographies down with it) but US trade policies shouldn’t be high on the list (trade rhetoric will stay a problem though). • Some of the next major macro events to watch in the weeks ahead: China’s Jan trade data (Thurs morning 2/14), US gov’t funding expiration (Fri 2/15), FOMC minutes (Wed 2/20), flash PMIs for Feb (Thurs 2/21), Powell’s Senate testimony (Tues 2/26), Powell’s House testimony (Wed 2/27), TrumpKim summit (2/27-28), US Q4 GDP (Thurs 2/28), US-China ceasefire deadline (3/1), US jobs report for Feb (Fri 3/8). Pioneer High Income (PHT): Monthly distribution increased by 3.9% to $0.0675 from $0.065. Pioneer Muni High Income (MAV): Monthly distribution decreased by 19% to $0.0425 from $0.0525. Cushing Real Income & Preferred Fund - the fund filed an N-2 on Feb 1 to list their shares. The ticker and the IPO date will be announced shortly. China Fund (CHN): The fund announced the expiration of their tender offer to purchase up to 30% of the fund's issued and outstanding shares. Based upon current information, approximately 11,800,248 Shares, or approximately 75.05% of the Fund's Shares, were tendered and not withdrawn through the Termination Date, including shares tendered pursuant to notices of guaranteed delivery. Because the number of shares tendered exceeded 30% of the Fund's outstanding Shares, the Fund will repurchase the maximum number of Shares covered by the Offer (4,716,803 Shares) using the pro-ration procedures described in the Offer to Repurchase included in the Fund's tender offer materials provided to stockholders. Alliance CA Muni Income (AKP): The fund announced that the board of directors has approved the liquidation of he fund, subject to shareholder approval. It is anticipated that the Plan of Liquidation and Dissolution will be submitted to ACMIF's stockholders at a special meeting to be called for that purpose on April 26, 2019. The close of business on February 19, 2019 has been fixed as the record date for the special meeting of stockholders. Blackrock Credit Allocation Income (BTZ): The board changed the non-fundamental investment policy. The change is meant to increase the flexibility of the fund to continue to invest in what Blackrock thinks are the most attractive credit opportunities. The change is expected to take place as of Feb 8th. The main shift in policy changes the amount that the fund can invest in non-US securities from 35% to 50%. This may include dollar-denominated and non-dollar denominated securities. New Policy: Under normal market conditions, up to 50% of the Fund’s Managed Assets may be invested in non-U.S. securities, which may include securities denominated in U.S. dollars or in non-U.S. currencies or multinational currency units. Average Credit Quality. The Fund’s existing investment policies permit it to invest, under normal market conditions, without limitation in securities rated below investment grade at the time of purchase. Notwithstanding this policy, the Fund has previously disclosed that it was anticipated, under then-current market conditions, that the Fund would have an anticipated average credit quality of at least investment grade. BlackRock currently intends to manage the Fund’s credit quality in accordance with its stated investment policy, which means that at times the Fund’s average credit quality may be at or below investment grade. There are no changes to the Fund’s investment objective or to other investment policies of the Fund. The largest NAV gainers by sector this week were real estate and taxable munis. We have moved from "everything is a buy" to a slightly overvalued position in a relatively short amount of time. It was only a few weeks ago that EVERYTHING on the Google Sheets was rated "Buy". We even had 3 "Strong Buys" at the time. Today, just four positions are rated "Buy" and we have three that are rated "Sell". This tells me the paradigm has shifted drastically. While there can be some dislocations in the CEF space, in general, discounts tend to gyrate together. In other words, discounts tend to tighten in unison and widen in unison. Overall, credit is in risk on mode and that is very much apparent in CEFs. Funds that traded at 10-15% discounts just a couple months ago are now trading near par. And yet nothing has changed as they have the same risks within them today. Bancroft Fund (BCV): This is a fund we've owned for more than a year now and it has been a turbulent time. Still, the trade has been a profitable one with a total return of over 15%. Most of this was made during the first three months of last year, then it promptly erased those gains in the fourth quarter. However, YTD, the fund is up over 13.8%. The fund is largely tied to the tech sector given most convertibles are issued by tech companies. At a 9.5% discount, the fund is still trading at a relatively wide absolute discount but is tighter than its 1, 3-, and 5-year average discounts in the 11-12% range. Much of that discount is likely due to the lower distribution the fund pays (quarterly). Guggenheim Taxable Muni (GBAB): This fund has been extraordinary! In the last 3 months, the total return on price is up over 14%. As we have noted, this fund has zigged while the market has zagged. I think investors have recognized that and are adding this high quality fund to their portfolios, regardless of the valuation. That said, they recently released their semi-annual report that showed some weakness in net investment income. NII was down to $1.30 annualized, from $1.48 last year. In addition, they have a likely call wall coming up in the near future (less than 2 years). We are doing some research (they do not report calls but apparently will be doing so shortly). For now, we are holding or even taking some small gains. Eagle Point Credit (ECC): This is a popular fund with the retail investor community. It is a high yield, high risk fund trading at a 28% premium. The fund only reports its NAV quarterly and in the fourth quarter, saw an 18.6% decline. Clearly the market believes that given the market rebound, the NAV is going to jump significantly when reported in late April. That is likely but I do think it's unlikely it jumps by 28% to leave the shares at par. Plus, things have to stay on the same track as they are now for another 45 days. It just seems like this is priced for perfection and even then over-valued. EV Enhanced Equity Income II (EOS): This is a fund that has a slight overweight to tech shares and has performed well over long time periods (3-, 5-, and even 10-years). 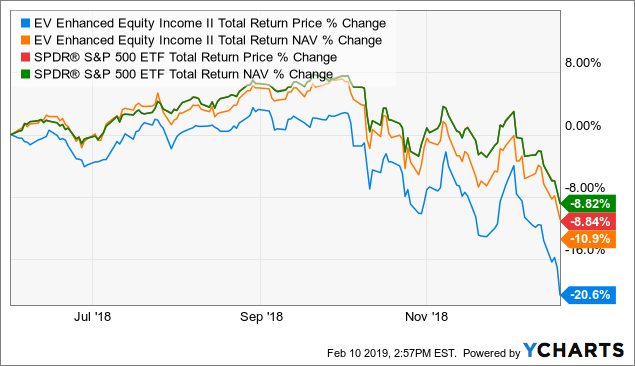 The fund is up an astronomical 16.4% YTD while the NAV is up 8.6%. That has resulted in a 6.1% premium and a one-year z-score of +2.20. The last time the fund was this overvalued, it underperformed the S&P significantly. Those that own it, including myself, may want to consider swapping to similar funds like ETY, SPXX, EOI, and BOE. From the chart below, you can see that the funds all showed similar performance on NAV over the last six months. BOE did a bit better given its more conservative holdings and strategy. Instead of owning EOS at a +2.20 one-year z-score, you could swap to a fund like EOI which has performed similarly and yet trades at a 3.15% discount and has a -0.40 one-year z-score. While -0.40 isn't a screaming bargain, it is a lot cheaper than EOS. The big news on the week was the cut to the distribution of MAV. This is something we had anticipated given the material deterioration of the financials. The alert when out when MAV cut and the price fell sharply. The price went from $11.05 to $10.46 in four trading days, a decline of 5.3%. That is well below the 19% cut in the distribution. The yield is down to 4.88% from almost 5.55%. We would not be adding here as we've seen discounts widen for over 2 months after a large cut. MHI saw a decline in sympathy but is still near its 52-week average in discount and yielding 5.60%. We still think a distribution cut is likely coming though the NAV is rising nicely. For now, better to be safe and cautious and move into better situated funds that are less likely to cut. For all the new members, we break down our weekly commentary in a few different sections. After four consecutive weeks of strong gains in the equity markets, stocks took a breather on the shortened holiday week. They did end the week on a high note as news about the U.S. and China being "miles and miles apart" was offset by the possibility of the Fed ceasing the roll-off of the balance sheet. and the government shutdown coming to an end. The Dow and Nasdaq rose slightly but the S&P 500 fell 5 points. YTD, the S&P 500 remains up 6.30%, the Dow +6.04%, and the Nasdaq +7.98%. Midcaps are up 9.29%, and small caps +9.89%. Given the shutdown, there has been a dearth of government data so the only thing we have seen is overseas. Given the increasingly globalized world, Japan, China, Germany, UK, and France are key drivers for our economy. Those economies appears to be slowing rather dramatically. Germany appears to be entering full blown recession, joining Italy who entered several months ago. France is likely not far behind. Earnings season continues to ramp up and the early part of the reporting season has been better than expected. The reported numbers are coming in ahead of lowered expectations but guidance is decent and the tone by management upbeat. That is especially true of the banking sector where a number of the largest bank CEOs were positive on domestic growth for the year. Also more positive - and something that could be an upside surprise catalyst for 2019- is Chinese growth stabilizing. The country has been slowing down over the past two years but there are signs it could be bottoming. December retail sales and industrial production results both came in ahead of expectations. In addition, President Xi has been pulling multiple stimulus levers to increase growth. If we see a 2H 2019 increase in Chinese output, it would definitely be a surprise and counter the current negative narrative. Onto the Fed which has moved in a dovish direction compared to two months ago. It appears that they are now fully on pause in terms of raising rates- the next possibility is likely the June meeting allowing another six months of data to flow in before moving again. If the economy continues to chug along, they will raise rates. But watch the bond market. If spreads remain wide, they will likely pause further. The timeline of events the last two months is interesting. Following the last increase in the Fed Funds Rate in December, the post 12.19 press conference was likely the driver of the markets lower. In it he indicated that the balance sheet would continue to shrink regardless of the macro environment. Just a few days later, Powell was on a panel with Yellen and Bernanke and read off notecards that walked back the 'autopilot' comments. On the 25th, the WSJ published an article summarizing the recent (last four weeks) comments by Fed officials. I would think that the Fed is likely to continue the current policy of roll-off, as the market has stabilized. Credit spreads have stabilized around 4.45 but are not falling back further (they did reach 4.27 on Tuesday). Interest rates were also stable on the week down two bps compared to last Friday's close. In general, the year is shaping up to be another where large caps do better than small caps, domestic better than international (EM may be the exception), and interest rates slowly rise. Below is the ECRI Weekly Leading Index. This is a private economic research firm that puts out their own leading indicators. It has turned negative several times this cycle and so far it is only modestly negative though it bears watching. The 10-year remains in no-man's land and is looking for direction. This is something to keep a close eye on over the next week or two, especially as the Fed has their January meeting on Wednesday. Remember, all Fed meetings in 2019 are "live" events. While there is virtually zero chance of a rate hike, the presser and the Q&A session will provide a lot of insight into their current thinking and courses of action. ClearBridge Nrg Midstream Opp (EMO): Quarterly distribution was decreased by 28.1% to $0.23 from $0.32. ClearBridge MLP & Midstream TR (CTR): Quarterly distribution decreased by 24.1% to $0.22 from $0.29. ClearBridge MLP & Midstream (CEM): Quarterly distribution decreased by 16.9% to $0.295 from $0.355. MFS CA Muni (CCA): Saba Capital Mgmt owns 387K shares or 13.9% of the outstanding shares, a 12.6% increase. Discounts across the CEF universe tightened by another 20 bps this week to an average of -6.88%. One thing we look at on a weekly (and monthly) basis are the changes in the general CEF space for a health reading. Below is the data for the last two weeks. You can see aggregate price rose by a couple of pennies while aggregate NAV fell by one penny- closing the discount a bit. Of note, we are now at a positive z-score reading for the first time in many months. On the Core, ARDC was one of the best NAV movers, again. From most perspectives, this is still one of the best opportunities in the taxable bond space today. At a 14.35% discount, nearly 4 points below the one-year average, a yield of ~9% and strong NAV trends. The one-year z-score is still -1.40, one of the few "bargains" left after the strong run in January. From a technical perspective, many of the indicators we follow are bullish at the moment. MACDs are squarely positive (as they have been for a few weeks) and money flow is helping. In addition, if the Fed is done or nearly done (including with the balance sheet- again we are skeptical of this and think the market is too dovish), it would be superbly positive for fixed income CEFs. While we wont be buying much this week- if anything- we likely won't be selling much either. The best opportunities today remain in the funds that are "high quality" (meaning they have high coverage, higher NII yields, still value z-scores and are in sectors we like). Another fund that appears attractive is Western Asset High Yield Def Opp (HYI). This is a term trust fund meaning it self liquidates at a certain date in the future. This is different than a target term fund that liquidates at a certain date in the future and at a certain price. HYI will liquidate at whatever NAV it is on the date of expiration. That date is September 30, 2025. At a discount of -13.25%, the fund is giving you over 2% of "juice" per year between now and liquidation. Anytime a term fund gives you over 2% per year in added return, it becomes attractive. And at the same time, this fund meets all our criteria with high coverage, high yield, and one of the lowest z-scores in the taxable space at -2.20. The NAV has been stable to slightly increasing in the last two weeks while price is down giving the current opportunity. Watch for further analysis in the near future. Nuveen recently released the December numbers for their closed end funds, both taxable and tax-free. On the taxable side, the floaters took a hit to coverage, which is not surprising given the fall in the index. Still, most ratios are above 100% except for JSD. From a coverage and UNII perspective, I do not see anything that would concern me for a distribution cut, especially since January has been such a strong month. On the preferred side, coverage has been consistent for over six months now. All four funds have been growing UNII comfortably. Recently merged NBB, their taxable muni fund, saw coverage decline despite the scale that is typically achieved in combining funds. On the muni side, Nuveen's high yield muni bent has been a benefit to their fund complex. Coverage has been relatively stable and not seen the same magnitude of decline as in years past. On the nationals, there are nine funds out of sixteen with coverage in excess of 100%. Only three funds have a positive UNII balance. The 3-month stacks on both UNII and coverage are great trend indicators for us. And obviously the color-coding conditional formatting helps identify the outliers. In coverage, our call on Nuveen Municipal High Income (NMZ) appears well timed. The fund continues to build both its sponsor-leading coverage (106.1%, up from 105.8% last month) and its UNII bucket (+2.2 cents, up from +1.7 cents last month). The fund continues to close its discount to NAV after reaching a 12.3% discount in late December. We had it as our top fund to buy today for discount capture. Since that update (read HERE), the discount has halved and is close to the 52-week average. The fund had cut the distribution twice in the last year which created the opportunity as the discount blew out. Why did they cut when the distribution was covered with room to spare? Perhaps they modeled 100% of the calls being replaced with lower coupons and perhaps that didn't occur. The call schedule for the next several years is decent with just 7-8% each year for the next three years. We opined a few weeks ago that the average bond price of $99 being under par suggested that half of the portfolio would not be hurt by a par-call. In other words, the call of those funds that are trading near par isn't a significant negative for the fundamentals. Credit quality is mostly investment grade with ~17% in non-investment grade and another ~26% in unrated positions. The z-scores show that the fund, after making such a strong move higher, is only now fairly valued, not over-valued. One-year z-score is +0.20. While a large part of the discount convergence trade is likely mostly done, there is probably still some juice left, in our opinion. In the meantime, the distribution is one of the best offering a yield of 5.48%. The one thing we want to watch closely is the NAV performance which hasn't been all that stellar compared to other high yield funds. On the note about Nuveen funds above, we thought it would be good to revisit the muni space given the movement of the funds in the last month. Many of those discount capture opportunities have closed significantly. For example, EOT was trading at a -7.3% discount a few weeks ago. Today, the fund is right at par. That is a massive move higher in a short amount of time. Another, VCF, went from an 8.3% to a 5.03% discount. That one, we think, still has a bit more room to run. We think there is at least another point or two to go. MYF was at a -7.7% discount and is now at a 4.1%. This is another one that has moved nicely but probably has a point or two left to go so we wouldn't sell. BBF was near a 10% discount and today trades at 4.8%, below the 52-week average of 5.7%. This one is probably close to being done. We will be doing more of an update next week with further analysis including on how much beyond the 52-week average some funds could go. Stocks notched their fourth consecutive week of strong gains and built on their YTD figures. The S&P 500 is now out of correction territory (down less than 10% from the peak). The Nasdaq and small caps remain in correction territory. We saw technology and financials lead the market while utilities and consumer staples lagged, something you want to see for a healthy market. The S&P 500 is now up 6.54% YTD, the NAS +7.87%, and Russell 2000 (small caps) +9.80%. The trade front saw further movement towards a resolution and sentiment continues to improve. China trade officials offered to eliminate the country's trade surplus by 2024 but U.S. officials want it to be done sooner. Interest rates continue to rise back towards 3% (something we said was highly likely) and we do see the 2.90% area as a near-term target. Given that the economic data is not nearly as dreadful as the markets and the media portrayed it, it made sense that bonds would sell off when the market began to recover. 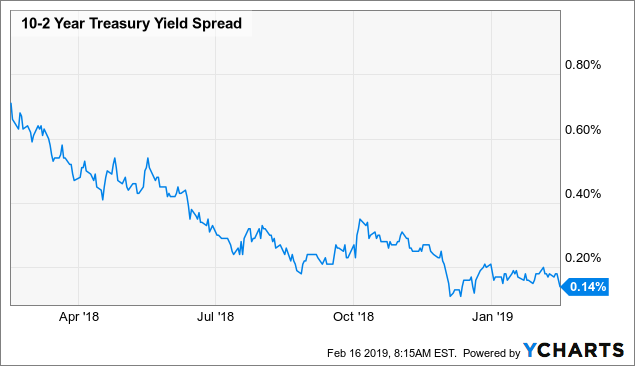 Investment grade and high yield bonds also saw spreads tighten during the week as the high yield market saw the largest weekly inflow in almost two years. HY spreads are down to 4.4% and continue to slowly revert back towards the levels we saw in September. The effective yield of the Master II index is now sitting right on 7%. The VIX (volatility index) continues to subside back towards normal levels hitting 17.8 after peaking on Christmas eve at 36. And the correlation with oil hasn't ceased with WTI rising another $1.20 this week to $53.10. Spreads on the yield curve continue to meander instead of showing signs of further tightening. The 10s-2s spread hovers in the teens. While that is not a lot of cushion, the trend perhaps is showing that a recession is not imminent. All in all, it was another solid week of recovery. The bears are still out in force touting how this is a dead-cat bounce but as each session passes, it is looking less and less like it. The media is hounding on Brexit, trade deals, and the government shutdown. But in reality, none of those things matter to the market. The market is being driven the 1) the Fed, and 2) technicals. That's it. However the media can only spend so much time on the Fed (which is also a dry subject) and technicals. The events in Europe are likely to play a role in our markets down the road but right now, the unfolding proceedings are just too nebulous. The end-result is still far too unclear to matter. When the populist uprisings in UK, France, and Germany (and soon to be Italy) foam to the top, we will likely see some reverberations in our markets. Until then, they are just a sideshow. Our markets only care about the Fed. And with the multitude of Fed officials hitting the speaking-circuit in the last few weeks, all talking pause or doves or lower for longer, it is no surprise that the markets have responded favorably. Even the most hawkish have come out and surrendered their hawkish tone in factor of "data dependence". The cherry on top came this week when Esther George, the Kansas City Fed President, stated that "we are close to neutral" and "we should proceed with caution and be patient as we approach our destination." If the Fed is close to the end of its tightening journey, then why are long-term rates rising? Clearly, like the stock market, there was an overshoot in the flight to safety which sent the 10-year yield all the way to 2.56%, from 3.25% only two months prior. It is looking more and more that lower for longer dovish policy is back- at least for a short while. That would be highly supportive of NAVs of bond CEFs. Nuveen OH Quality Muni Income (MUO): Ancora Advisors LLC owns 920K shares or 5.02% of the outstanding. According to the 13D, they only believe the shares are undervalued. Mexico Fund (MXE): City of London Investment Group own 3.59M shares or 24% of the outstanding, a 29.8% increase. Invesco Dynamic Credit (VTA): Saba Capital owns 4.7M shares or 6.37% of the outstanding. Invesco High Income II (VLT): Saba Capital owns 1.17M shares or 14.5% of the total outstanding. A 10.2% increase. Western High Income (HIO): Saba Capital owns 13M, or 10.1% of the total outstanding. MS China A Share (CAF): City of London Investment owns 2.36M shares or 10.8% of the outstanding. Nuveen Muni 2021 Target Term (NHA): Karpus Management owns 924K, which is 10.7% of the outstanding. MFS Govt Market Income (MGF): 1607 Capital Partners owns 5.25M shares or 16.1% of the total outstanding. Nuveen Taxable Muni Income (NBB): The fund commenced its tender offer commencement period which will expire February 12th. They are tendering 20% of the outstanding shares (an effort to get their fund to a perpetual trust as it was slated to liquidate next year). The tender is at NAV minus a net repurchase fee which is estimated to be less than $0.03 per share, assuming a fully subscribed tender offer. China Fund (CHN): The fund announced an extension of their tender offer for up to 30% of the fund's outstanding shares. The tender is at 99% of NAV as of the close of regular trading on the business day immediately following the day the offer expires- February 5th. Funds from the Core CEF lists that have made the largest price moves, NAV moves, largest discounts and premiums, and lowest and highest z-scores. Funds in the entire CEF universe that have made the largest price moves, NAV moves, largest discounts and premiums, and lowest and highest z-scores. Discounts are continuing to recover as indicated by the chart below. They have nearly reached the levels achieved in early October. At a 4.99% discount, it is nearing the one-year average of 4% and is close to the 5-year average of 4.59%. More importantly, NAVs are showing strong recoveries as well. We are seeing investors take advantage of the double-discounts apparent in the CEF world with the underlying bonds at a discount to par and the fund itself at a discount to NAV. Thus, when the underlying bonds start to appreciate, you get a compounded snap-back. I spent some time looking at what Saba has been doing including what they hold in their ETF (CEFS). While our Core Portfolio has significantly outperformed the ETF over the last year, it could help to cherry-pick some of their best ideas. For instance, Nuveen Credit Strategies (JQC) is their top holding. They recently pushed for a new capital return program. They continue to build positions in JQC, HIO, and EHI. The Saba track record for activism in CEFs has not been great. Karpus and Bulldog are far more effective in pushing for change and winning. In my mind, Saba has too many pots on the stove to be as effective on a percentage basis. The monthly release of the PIMCO UNII and EPS report was released this week showing some improvement to the muni side and a mixed report on the taxable. In December, 7 of the 9 muni funds saw equal or improved coverage and UNII ratios. On the taxable, 7 of 11 funds saw improvement on coverage ratio with all UNIIs flat or down due to the special distributions paid out last month. The average coverage ratio fell for the second straight month to 104.5%, from 116.3% in October. The fourth quarter did see general weakness across most of the sub-sectors in their taxable CEFs including non-agency MBS, high yield, floating rate, and emerging markets. In terms of the absolute coverage ratios, PIMCO Credit and Mortgage (PCI)continues to run higher at 192%, up from 173% last month and 127% in September. To us, it is likely that the fund has taken off their interest rate hedges that were betting on higher rates and cashed in the gains. That does flow through net investment income ("NII") on these monthly UNII and EPS tables as they are done on a tax basis, not GAAP. PIMCO Dynamic Income (PDI) did not see as much of a coverage bounce. It could be that they have not taken off the same hedges or simply did not have them in the first place. Or, PDI has an at-the-market offering (essentially issuing new shares slowly into the market increasing share count). As the fund increases in size, they may be leaving some of the hedges on as they will naturally decline as a percentage of the total portfolio. Given the weakness of non-agency, HY, and EM debt, the lower coverage is not a surprise. On the muni side, the bleeding on UNII has abated slightly in recent months. Of note is PIMCO CA Muni II (PCK) which swung from a -6 cent UNII to +1 cent as coverage rose over 100%, from 91.5%. That caused us to change the rating on the muni core tab from 'hold' to 'accumulate'. The price has run up in the last few weeks (like most muni CEFs) and is about 11 cents above our price target for a buy rating. The 3-month stacks (essentially the 3-month average vs. the 3-month average from 3-months ago) are showing much reduced changes recently. Most of the PIMCO muni CEFs are down to the low-single digits in terms of UNII movement. This compares to double -digit declines that we were seeing for most of the last two years. But this is to be expected. The chart below is from a recent CEFAdvisors webcast showing relative UNII trends going back 6 years. The recent flattening is to be expected as most muni CEFs have cut their distributions- in some cases significantly- in the last two years. While calls have been forcing that for the better part of a decade, in the last two years muni CEFs have had to also contend with rising leverage costs- a one-two punch! We have discussed this long-term secular cycle that muni CEFs have been in for some time. They pay out a high distribution rate, refusing to make a cut until they absolutely have to, draining the UNII balance. As bonds get called away with new bonds yielding far less than bonds issued ten years ago, they are forced to cut the distribution. At which point, coverage goes back to 100% or higher and UNII balances stabilize. Then, the cycle begins anew as calls eventually eat away at coverage again. In aggregate, the muni CEFs have been doing better lately and we like the setup for them going into 2019. We did last year as well and the first half of the year clobbered us, only to be redeemed later on. The PIMCO muni CEFs have rallied strongly recently and z-scores, which were soundly negative earlier this year, are now showing slightly expensive. PIMCO Municipal Income II (PML) has run from an 8% premium to almost a 15% premium in the last couple of months. In terms of municipals, there is much less transparency into the holdings compared to most other fund sponsors. We get little in the way of call schedules, coupon yield, or most importantly, credit quality breakdown. All they report is state breakdown, sector breakdown, and % in Puerto Rico. If we go back to the Merrill Lynch CEF report from early May, Lanik (the analyst) appears to have put the holdings from the annual report into Bloomberg to get that data. That output shows a lot of calls for 2018 and 2019 totaling 19% through May 2019. Credit quality is also showing three-quarters investment grade and one-quarter non-investment grade. The fund pays out far above what it earns but continues to wind down its UNII bucket. The UNII figure was 40 cents at the start of 2017 but has bled lower to the current 24 cents. It was burning off over 1 cent per month for a while but has since been able to slow that burn losing only 1 cent since September. That pushed out the date for when they would need to do a substantial cut to the payout. We prefer, from a fundamental standpoint, PIMCO Muni Income (PMF)currently as the fund is covering the distribution and has stabilized, and recently growing, UNII. The yield is 5.48% tax free and the NAV has performed well. Of course, the market has recognized this and sent the shares to over a 6% premium. Watch this one and stagger your buys at or slightly above par. We would be cautious on two of the PIMCO NY munis, PNI and PYN along with PMX among the nationals. Getting back to the taxables, we recently launched our PIMCO CEF Comparison Sheet. This is a quick and easy way to compare the differences in sector allocations of the multi-sector funds (PCI)(PDI)(PCM)(PCN)(PTY)(PKO)(PFN)(PFL). For simplicity, PCI/PDI/PKO are very similar funds. Then you have PTY/PCN/PFN/PFL being similar. After that, you have PCM, which sits between the former funds and the higher-yielding, higher risk funds of RCS, PHK, and PGP. PIMCO StocksPlus (PGP) is essentially is similar to PFN but with a long futures position in the S&P 500. We would avoid PIMCO Strategic Income (RCS) which has rallied strongly but is likely going to need a significant distribution cut this year. As a reminder, this fund is attempting to reclassify the way they account for mortgage rolls for income tax purposes. PIMCO wants to classify them as a sale or exchange to use up their tax loss carryfowards in the fund. This would increase the proportion of the distribution that would be classified as return of capital. While most shareholders will sell because of the likely massive distribution cut, it is good for investors over the long-term. Why is that? The current payment is likely already ROC but being taxed to them as ordinary income. So while it will benefit them long-term, in the short-term the price is going to get creamed. For the first crop of PIMCO CEFs including PCI and PDI who are exposed primarily to non-agency MBS, they struggled in the fourth quarter along with everything else. This despite the fact that they were able to ignore the high levels of volatility earlier in the year. Even with the slowing housing market and weaker prices, continued payments towards loan amortizations continues to reduce loan-to-value ratios. The likelihood of default should another severe downturn occur characterized by skyrocketing unemployment is reduced. The non-agency MBS market is now down to approximately $400B, from $500B earlier this year, and $2.1T as the crisis began. In addition, new issuance is starting to pick up for the first time since the crisis, exceeding the roll off from legacy issues. This could be why PIMCO chose to reduce their allocation to the space. Or, given how high yield, leveraged loans, and emerging market debt had been decimated in the fourth quarter, perhaps they see better relative value compared as non-agencies fell far less. With high yield spreads and leveraged loans recovering, we still believe the non-agency sector has one of the best risk-adjusted returns in the fixed income market. Another area that PIMCO has allocated significantly is the asset-backed securities market, specifically the federally guaranteed student loan space. From a valuation standpoint, the recovery in the PIMCO taxables has been sharp and quick. The values we saw around Christmas are all gone. We were able to pick up some PIMCO Corporate and Income (PTY) very close to par. It was then announced that the fund would be added in closed-end funds indexes. That news and buying helped push the fund quickly back to a 10% premium. PCI reached a premium again on January 17th after hitting a 10% discount less than a month prior. To us, the fund is fully valued. The chart below shows the NAV total returns in the last year with the three non-agency MBS-based funds at the top of the list. Overall, this last PIMCO CEF tantrum was a very profitable one and now we will likely reduce our overweight and wait for the next one to occur. It is always difficult to buy when the market is falling 500+ points and your quotes screen is a 'sea of red'. However, that is the best way to make money- being a contrarian and putting emotions aside. The Google Sheet helps with that as it takes the emotion out of buying and selling. By ignoring the market noise and positioning the portfolio towards those target allocations and using the buy/sell flags, you can go against the grain. Member Comments - "Should I Sell?" We are currently reducing our stake, slowly, in PCI and PDI to target or slightly below target levels. Valuations are high and we want to be positioned for another downturn. We get the question, "should I sell?" often, especially when the Google Sheet flips to a "sell" rating. Remember, the sheet is formulaic with real-time quotes that calculate the discount/premium perpetually. Once the discount/premium reaches the "sell over" level, the flag flips to a "sell". The answer to the question is a personal one. If you are a buy-and-hold/rent investor, preferring the income and not caring much about the day-to-day changes in value, then holding is the answer. Simply prefer to collect the income and consider the fund an annuity. If you are a total return investor, or a more tactical trader that tends to go to cash and wait when valuations are high, then trimming/selling is the answer. Right now, there aren't many places to allocate that capital if you do indeed sell. The January effect is in full force and lifting all boats. Discounts across the board have tightened materially in just 3 weeks leaving little behind. We obviously would not be adding here. Additionally, the NAVs of most of these funds are performing well from a technical standpoint with strong RSI and MACD indicators. In other words, it's not just a recovery of discounts occurring, but a recovery of NAVs as well. This could shift the decision on when to sell as, even though the discount isn't closing any more, the NAVs are rising further pulling up prices. In my personal portfolio, I had reached a 28% allocation to PCI when including the Flexible Portfolio allocation. I have been reducing that allocation back towards the 18% level slowly. I also did take some gains in PDI which was over target but did sell to below target, ~9.2%. The proceeds of which are currently being allocated to cash while looking towards other opportunities, especially in the individual preferred space. A side note on the above chart which has PGP near the bottom of the list for NAV total return. If you look at the corresponding price total return chart, PGP is near the top of the list, (fourth place) showing the benefit of buying funds cheap! Even if they do not perform well on a NAV basis. Z-scores are back to being decidedly positive, a condition that we experienced for most of the summer. They range from +2.60 (PNF) to 0.00 (PFL). Only PCN, PTY and PCM are in negative territory at -1.2, -0.80, and -0.50. Nothing that screams bargain but closer to that hold level mentioned earlier. Most of the funds have simply returned to where they were towards the end of the third quarter. If that is the case, then Z-scores won't show strongly positive and overvalued. But, were the funds overvalued then as well? The fourth quarter would suggest so as the funds sold off quickly at the sign of danger. Or perhaps the anomaly was the fourth quarter- a non-recessionary bear market brought on by extraordinary exogenous factors. Certainly the dovish tone out of the Fed suggests a re-rating is needed for leveraged fixed income products. That is supportive of both NAVs and spread products. The question is, what valuation are you willing to pay? There are a few alternatives paying that juicy yield but none with the long-term track record of the PIMCO twins. Nuveen Credit Strategies (JQC) has adopted a capital return program meant to enhance the fund's competitiveness and reduce the large discount. The fund will return 20% of its common assets or $240M over the next three years through supplemental distributions (essentially ROC). The supplemental will be about twice the monthly income distribution. As of December 14, 2018, the total distribution of $0.1015 would result in distribution rates of 14.1% and 16.4% on net asset value and market value, respectively. Closed-end fund historical distribution sources have included net investment income, realized gains and return of capital. The extra distributions would amount to approximately $1.75 per share. The fund is attempting to increase the demand for their shares thanks to the increased yield thereby closing the discount materially. Additionally, the fund revamped their portfolio last year in response due to the poor investment returns compared to the benchmark and peer group. Q. How does the Plan enhance shareholder total returns? A. To the extent JQC continues to trade at a market yield comparable to current levels, the Plan enables JQC’s common shareholders to effectively capture, via an overall increase in the value of their overall JQC investment, a portion of the differential between the market price of the Fund’s common shares and their underlying net asset value. This represents a potential source of significant incremental common shareholder return in the current market environment. Based on the 14.3% discount to net asset value of the Fund’s common shares as of December 14, 2018, if common shareholders were to receive 20% of their portion of JQC’s capital under the Capital Return Plan they would receive a potential cumulative incremental return of approximately 3.3% over the life of the Plan. The plan is clearly in response to Saba's activism which noted in their 13D SEC filing that they planned to engage in discussions with management about "strategic plans and matters relating to the open or closed end nature of the Issuer and timing of any potential liquidation of the Issuer." To us, it looks like a bit of an opportunity as the activist are not likely to let up if the discount does not close in the next year. In the meantime, you have a juiced up yield, similar to what drives the premium valuation of Western Mortgage Def Opp (DMO) to a premium. That fund has a NII yield of approximately 7% but then is paying out capital gains to push the yield north of 10%. That double-digit yield is like a siren song for many retail investors creating significant demand for the shares, and sending the valuation higher. The same result could be seen with JQC and its SUPER-juiced 15.82% distribution yield. The markets continued to repair themselves although by weeks end, appeared a bit tired. The strong start to 2019 of course only has materialized after a very weak fourth quarter in 2018- including a rare non-recessionary bear market. Stocks were up for the third consecutive week with small caps outperforming finally allowing the Russell 2000 Index to emerge from bear market territory. The S&P was up 64 points or 2.47%. Volatility also continues to moderate with the VIX hitting the lowest levels in a month and ending the week near 18. We are now more than half way from the pre-October levels. Much of the healing has been due to hopes that China and the U.S. will come to an agreement or at least make significant progress towards one. Talks began on Monday and were expected to last for 3 days. Meanwhile, the partial government shutdown rolls on but hasn't seemed to impact the market. Now in its third week, there is still only small hope that a resolution is near. The impact on the economy and the markets remains marginal although that may change. President Trump is likely to use his emergency powers to get the border wall built and re-open the government before any real damage is done. The Fed speakers this week reiterated the dovish tone signaling that they are on hold until further notice. Chicago Fed Chief Charles Evans was probably the most influential and important. He has been an avowed hawk (favoring higher rates). This week he came out and stated the FOMC would be watching the data for the next six months before deciding again on rates. This seems to indicate that the March hike is being 'skipped' and that June is the likely next move. He also stated that it was "noteworthy" how much focus the market has placed on the balance sheet suggesting that some changes to it being on auto-pilot could be in store. Interest rates moved up after reaching 2.55% on January 3rd. This compares to the 3.23% hit two months earlier. Today, the 10-year sits around 2.70%. Now we turn to earnings season which continue to get marked down providing pressure on the index. At the start of November, the S&P EPS estimate for 2019 was $178. We have already seen that decline to $170-$173. While it doesn't appear to be much, applying a 15x multiple to the variance equates to 120 points on the S&P or nearly 5%. During the final two weeks of Christmas, some figures did fall into the $160s but those have since been revised back up to the $170 area. Assuming a 15x multiple on means that the S&P target is around 2550 on the low end. Using a 16x multiple would push us up to 2,720. That appears to be our near-term range. Of course, if numbers get revised back up, the 'ceiling' will be much higher. Bottom line, the fourth quarter was probably correct on the narrative with a lot of headwinds but was likely incorrect in magnitude. That is, all the negatives that existed (slowing growth, tightening monetary policy, trade wars, fiscal issues, earnings, and political uncertainty) were apparent and not gone today but the move was too violent, overstating the immediacy of the risks. I personally blame ETFs and algos for exacerbating the moves. RiverNorth Doubleline Strategic Opp (OPP): Monthly distribution increased by 22% to $0.1833 from $0.15. Clough Global Eq (GLQ): Monthly distribution decreased by 6.5% to $0.1043 from $0.1115. Clough Global Opp (GLO): Monthly distribution decreased by 5.6% to $0.0829 from $0.0878. Clough Global Div & Income (FLV): Monthly distribution decreased by 4.3% to $0.1003 from $0.1048. Eaton Vance Tax Managed Global Div Eq (EXG): Monthly distribution decreased by 19% to $0.0616 from $0.076. Special Opportunities Fund (SPE): The fund announced that because of the 2018 year-end cash dividend of $1.45, the conversion price for each share of preferred stock decreased from $16.86 to $15.41. Holders of the convertible preferreds and whom elect to convert it to common would receive 1.6223 shares of common. The fund's board may elect to call them at $25 per share as they recently passed the earliest call date. EV Limited Duration Income (EVV): Saba continues to build a position with 6.28M shares, 5.41% of the fund's outstanding. First Trust High Income LS (FSD): Saba is now building a position in FSD with over 2M shares or 6.02% of the total outstanding. The snap back in discounts that we have witnessed in the last few weeks has been the most jarring in memory. Z-scores continue to heal with the average across all categories at -1.13. Across all bond and stock categories, real estate is now at the widest discount at 13.8%. The multi-sector bond category is back to a premium thanks to DMO, PTY, PDI, and a few others. Dividend equity funds saw a 7% move on average last week, the largest of any sector. NAVs of that category were up 3.95%. The weakest sector was taxable municipals which, on average, saw approximately 39 bps of price decline and 28 bps of NAV decline. Tax-free munis were also down slightly on NAV (-17 bps) but saw significant discount closing with the average price up 1.83%. This is exactly what we were thinking would happen. MLPs were the big winner on a NAV basis rising 8.87% on the week with prices up 6.42%. All energy did well again last week with the equity energy and resources category rising 4.85% on price and 4.89% on NAV. We continue to closely watch the senior loan (floating rate) category which had another good week returning 1.08% on NAV and 1.79% no price, closing the average discount by 71 bps. NAVs did decline on Thursday and Friday as the index saw some mild weakness again. Preferreds, the other category we have been fond of lately, especially on the individual side, saw strength again this week despite interest rates moving higher. The category's average price was up 2.90% and the average NAV was up 2.05%. Some z-scores are a bit expensive here. EV Enhanced Equity II (EOS) recently raised the distribution which isn't really a surprise given the move in the NAV the last few years. With a big cap tech bent, the fund has benefited from Amazon, Google, Facebook, and others. While those stocks are down from their peaks, they still have significant gains in them over the prior five years. Check out Voya Global Equity Div Prem Opps (IGD) for a possible replacement. The game plan for 2019 will be a steady de-risking of the portfolio as we near the end of the cycle. For example, on the chat we discussed floating rate securities. They have moved higher significantly in the last couple of weeks from a severely oversold position. But once closer to par, we will likely trim that exposure significantly as short-term interest rates are unlikely to head significantly higher. On Friday, I did sell out of my DMO position given the sharp move higher (it hit a preset limit order price) along with about 10% of my PCI position (~2.6%). I'll continue to opportunistically trim that position back to the target weight (18%) over the next week or so. I do think that given the ex-distribution date being Friday, we could see a bit of a pull back in the PIMCO CEFs in the first half of next week. The annual report for BTZ came out a few days ago. We'll go through some of the changes and any red flags that are evident. The company did utilize the share repurchase program to buy back nearly $31M of shares during the year. That is up substantially from the prior year's $8.8M in repurchases. Overall in the year, net assets fell by $158M driven by the change in unrealized values (depreciation of assets) from wider spreads and higher interest rates. The decline of total net assets is approximately 9.9%. That was offset by some of the timing of distributions and other factors. The fund earned on a net per share basis $0.81 and paid out to shareholders $0.80 covering the distribution. This is the first year without a return of capital since 2014. Total expenses continue to tick up from 1.23% to 1.82% as interest expense (borrowing costs) have increased. The fund has increased its derivative positions but it is still relatively small compared to total fund assets. They have a very small long position in the 2-year and 5-year treasury note space. But they have some short futures positions in the 10-year. Overall, no red flags or big changes in the last year (or last several years). This fund tends to set it and forget buying an array of credit quality corporate bonds with 4-8 years to maturity. The effective duration of the portfolio is 5.8 years. We're not overly wild about the industry breakdown with 21% coming from the banking sector, 14% from communications, and 13% from energy. Of all the industries we dislike currently, that is three of them (add in utilities). Coverage in November was 102% (December numbers out in a couple of weeks). UNII grew in the last month to 1.1 cents. This is a generic way to gain access to the corporate credit market with plain vanilla corporate bonds to mostly higher quality companies. The credit quality breakdown remains decidedly investment grade with more than half of the portfolio in the BBB-rated debt. That is debt that resides at the lowest rung of the investment grade category and could be downgraded in the next crisis. I did go through the holdings and there weren't any significant holdings of the larger bad players. There was no holdings in AT&T (T) and only one smaller position (0.25%) in General Electric. The fund also has a small allocation to the upper tranches of some CLOs. We created a spreadsheet to compare the PIMCO taxable CEFs. There is a lot of confusion about the funds many of which are primarily different flavors of the same multi-sector exposure you would get in the open-end PIMCO Income (PONAX) fund. We will likely have this in the tools drop down fairly soon. The non-agency MBS totals are down approximately 15-20% over the last several months. We are trying to find out why they are reducing that allocation and where they are adding. Right now it appears that high yield and emerging markets are the beneficiaries of that capital. The big news on the week was the jobs number that came out on Friday showing a surprising 312K new jobs created in December. In addition, the two prior months were revised higher. The unemployment rate did tick up to 3.9% because of a boatload of new entrants to the workforce. On the news, stocks rallied fiercely as did interest rates which hit a 10-month low earlier in the week. The other key data points came on Thurday from Apple (AAPL), which warned on their first quarter results, and ISM. ISM Manufacturing index unexpectedly fell sharply to 54.1 compared to an expectation of 57.5. The number is still above 50 indicating expansion but the steep drop in the new orders component of the index (a leading economic indicator) definitely spooked investors. We also had two former and the current Fed chairpeople hold a panel discussion at the American Economic Association. The event was expected to be largely benign but early on, Fed Chairman Jay Powell read some prepared notes saying that the Fed would be "patient" in raising rates. That helped spark the markets. All in all, it was an excellent week for risk assets as the S&P 500 rallied 1.90% despite it being a short week. Small caps did the best rising 3.22%. Bonds also rallied with the AGG up 0.46% and munis up 0.37%. The VIX also hit multi-week lows which is supportive of closed-end fund discounts. I think if we can break the 18-area, we could be in the midst of a nice rally and have the lows behind us. The 10-year rate hit a low of 2.55% during the week, down 70 bps from the highs set in October. I do think this is the interim low for the rate and that we could see it move back towards 2.80-2.90% fairly quickly- especially if the VIX continues lower below 18. The largest headache for the markets has been the Fed and trade worries. Both seem to be on the wane as Powell has softened his message- something we said was assured after the Dec 14-15 FOMC meeting. On trade, the spat has been improving slowly ever since the G20 meeting. Talks resume next week and expect a more conciliatory tone out of the WH following Apple's warning that the trade war was- in part- to blame for their figures. JPM- Major events investors are watching over the coming weeks (in order of importance): 1) earnings – more than anything, the CQ4 reporting period (including the mgmt. commentary on the conf. calls) will determine whether the SPX hangs out between 2400 and 2500 or attempts to recoup some of the Dec slump. Earnings kick off w/Citigroup on Mon 1/14 but the season will drag on into Feb; 2) the Fed – the next big events include minutes from the 12/19 FOMC meeting (Wed 1/9), remarks from Powell at the Economic Club of Washington (Thurs 1/10), and the US Dec CPI (Fri 1/11); 3) US economic data – investors will be looking very closely at the upcoming eco numbers for Jan, esp. the Fed surveys and PMIs/ISMs to see if trends rebound from Dec. Empire is out 1/15, Philadelphia is 1/17, and the flash PMIs (for the US, Europe, and Japan) will hit on 1/24. The first look at US Q4 GDP arrives on 1/30; 4) China economic data – imports/exports for Dec hit on 1/14 but the next big round of Chinese eco data arrives on Mon Jan 21 (Q4 GDP along w/Dec retail sales, IP, and FAI) followed by the Jan NBS PMIs on 1/31; 5) US/China trade – investors increasingly anticipate a final détente but nothing has been set thus far. The next round of negotiations is scheduled for 1/7-8 (in Beijing) followed by meetings in Washington later in Jan or early Feb. The ceasefire expires 3/1 but that can always be moved back so long as progress is occurring; 6) Trump – he will travel to Davos for the WEF (1/22-25) and the State of the Union is scheduled for 1/29. Meanwhile, media reports suggest the Mueller probe could be wrapped up by mid-Feb. The big economic data point will be out tomorrow morning with the ISM non-manufacturing PMI and factory order data. It will either confirm the slowdown indicated in the manufacturing PMI released last week or show that it's an anomaly. Expect the rally in rates to reverse and the 10-year to reverse course and head back towards 2.9%. That could weigh on muni returns which have been strong in the last couple of weeks. But the opportunity in that space remains strong given the massive discounts and need for tax-free income amid waning supply. Invesco Senior Income (VVR): Monthly distribution increased 7.7% to $0.021 from $0.0195. Lazard Global Total Return (LGI): Monthly distribution decreased by 23.2% to $0.089 from $0.116. Delaware Enhanced Global Div & Inc (DEX): Monthly distribution decreased by 4% to $0.091 from $0.0945. Delaware Dividend and Income (DDF): Monthly distribution decreased by 4% to $0.091 from $0.095. MFS Special Value (MFV): Monthly distribution decreased by 3.6% to $0.0436 from $0.0452. MFS CA Muni (CCA): Monthly distribution decreased by 2.86% to $0.034 from $0.035. MFS High Income (CIF): Monthly distribution decreased by 2.34% to $0.01919 from $0.01965. Saba is building a position in Western Global High Income (EHI) with $5.327M shares, 11.9% of the outstanding, a 127% increase from their previous filing. The fund was also removed from the YYY ETF which could have helped produce a wider discount. Nuveen Taxable Muni Income (NBB): The fund's tender offer measurement period from December 14th to December 28th concluded. The merger agreement for the elimination of the term provision, name change, and shift in investment policy announced in November stated that if the fund was at a discount during the measurement period, it would conduct a 20% tender offer. The fund's average discount was 7.97%. Accordingly, the fund will conduct a tender offer and will purchase up to 20 percent of its outstanding common shares for cash at a price per share equal to 100 percent of the net asset value determined on the date the tender offer expires. The net asset value that shareholders receive will be net of a repurchase fee which is estimated to be less than $0.03 per share, assuming the tender offer is fully subscribed. The fund currently expects its tender offer to commence on January 14, 2019 and expire on February 12, 2019, unless extended. CEFs rallied hard this week thanks to a risk-on attitude plus the change in the calendar moving us out of tax loss harvesting season. The list below shows the sectors (as indicated by CEFConnect) and the NAV and price changes in the last week. The big winner on the week were MLPs as oil rallied and the severely beaten up sector recovered a bit. Prices there were up over 11% with NAVs up 6.9%. Preferreds were also up nicely rising 1.91% on NAV. We suspected that there was a lot of retail tax loss selling in November and December causing a dislocation in prices. This could be the start of a reversal. We still like playing this from the individual side. (again, new report out this week). Taxable Munis saw not a ton of NAV movement higher (+0.15%) but there was definitely buying as prices rose by 1.81% closing discounts by 1.55%. 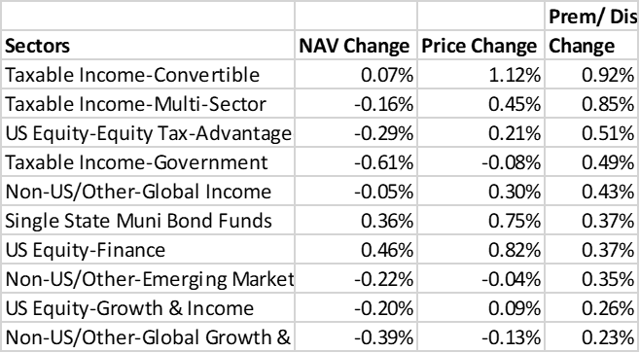 Tax-free munis fared better with NAVs rising 0.50% and prices jumping 2.57%. Almost 2 points of discount closing were realized last week. Single state munis did even better with 2.73% of price appreciation. High yield saw both NAV and price rally along with equities jumping higher. Floating rate also saw a nice boost with NAVs rising by 1.52% and prices jumping by 3.02%- in a week!! As we suspected, CEFs rallied hard in the first week of January. We expect this could be a substantial January effect this year (there wasn't much of one last year). The wide discounts could close further but in the first week, we have already surpassed the average January effect realized over the last 20 years. Both the price and NAV jumped this past week as we suspect money finally stopped or slowed flowing out of the leveraged loan space. Other floaters have jumped as well. TSLF for example, is up 6.6% since Christmas ever. JSD is one of the best up over 8%. DSU is up over 5%, ARDC is up 4.7%. Others haven't jumped nearly as much: AFT +2.6%, BGX + 1.2%, BGB +3.4%. HFRO, which was one of our top picks for January is up 8.8% (some of this return came before we recommended it). Volatility is likely to remain the name of the game this year Investors need to assess their true risk tolerance in light of the last three months. Many CEF newbies were shocked by the price volatility and others by the NAV volatility as this was their first experiences. If we have another week or so of this kind of rally, we would be using it to reduce overall risk levels and improve credit quality and/or augment safe buckets. The cycle is likely to be over in the next 9-18 months. As such, adding protection and improving overall portfolio quality will be the name of the game in 2019. We will be doing a full muni review as well as an individual preferred review this week. As noted above, we do think interest rates will move back up. The muni sector is hot right now as it is a safety trade. Those looking to add here should consider simply adding existing holdings or even a broad ETF as it is more important to have exposure to it over worrying about the perfect fund choice. Distribution cuts won't be announced again until February 1, more than 3.5 weeks from now. FPF recently issued their annual report for the period ending October 31, 2018. The preferred space spent most of the year in negative territory thanks to the rising interest rate environment we had been in. But even when that reversed course in the last two months of 2018, preferreds sold off again as tax loss harvesting and credit risks were the catalysts. The NAV for FPF over the trailing twelve months through October was -2.23% compared to the benchmark of -1.67%. The main under-performance of the fund is because of leverage- both because of decompounding but also because of leverage costs rising. For the fiscal year, the retail market fell 1.23% while the institutional market lost 2.14%. As we noted about a month ago, there was an emerging opportunity in the individual preferred stock space as retail investors sold off anything in the turmoil of the market. FPFs management noted that they also saw this opportunity in the retail preferred space ($25 par). The fund's performance was aided by the floating rate allocation as well as the hedging strategy- primarily interest rate swaps. Performance was negatively effected by the international holdings including UK, Italy, and other European banks. Only 43% of the holdings are U.S. with the majority of the remainder coming from Europe (UK 11.6%, France 10.3%, Italy 5.6%, Canada 5.2%, etc). This is why we have been favoring individual U.S.-based preferred stocks over the funds. For one, you do not have the leverage problem where by interest expense is rising much faster than earnings from holdings. Second, the rising dollar and weakness in Europe does not become a factor like it has for FPF. The fund cut the distribution last May (April announcement) for the second year in a row. It is certainly possible that they may do this again this spring as current earnings are likely under the current distribution rate. The fund has closed its discount materially in the last month going from a 15+% discount to just 5.8% as of Friday. That rally has helped close the negative performance over the last three months to just 1.28%, down from over 6% not long ago. At these levels, the fund is not very attractive, especially relative to individual preferreds which continue to trade far below par. We will be doing a full review of the preferred space next week. The fund recently released its annual report (yesterday) and we read through it to see if there was any material changes, red flags, or highlights worth mentioning. Over the last year, the fund increased exposure to bonds by 236 bps in order to increase income production. During periods of volatility, they have picked up longer-dated, higher-quality bonds that have sold off. On the loan side, despite the increase in libor by 1.18% over the last twelve months, they have decreased their exposure by 5.21% to the space. This was because the majority of the loans in the loan market were trading above par. They believed the potential for loan repricing was high and saw bonds as being the cheaper relative value. They also increased their CLO debt and equity exposure by 139 bps and 221 bps, respectively. Management believes they have opportunistically adding double-B tranches and some secondary equity positions at good values. Duration is still very low at 1.5 years. In regard to the CLO market, difficult arbitrage conditions have slowed the pace of new issue supply in recent months. While year-to-date 2018 global issuance of $140.6 billion is tracking in line with full-year 2014 issuance of $143.0 billion (a record year), there exists today something of a "buyers strike" on primary issue CLO equity. The proximate cause of all the trouble is the CLO debt spread widening stemming from heavy refinancing and reset activity, which stood at $161.1 billion across 326 deals year-to-date as of October 31st. This supply has weighed heavily on primary issue spreads, making arbitrage conditions persistently difficult. Triple-A spreads have also been affected by higher hedging costs for non-U.S. investors, especially Japanese investors who have seen deteriorating relative value in U.S. CLOs vs. European CLOs as a result. Until and unless CLO debt spreads contract, we expect relatively modest new issue activity through year-end. In terms of the fundamentals, net investment income (NYSEMKT:NII) was virtually unchanged in the latest fiscal year compared to the year prior. However, that is where the similarities between the funds ends. Realized gains on investments and currencies was $+4M compared to $+1.6M the year before. However, unrealized gains/losses was down $16.8M in 2018 versus a $+18M gain in 2017. So while net assets rose $22M in 2017, it lost $11M in 2018. NII per share has been very stable and while unrealized losses have increased this year, not surprisingly, as spreads have blown out. Distribution coverage increased to 104.4% so no distribution cut is likely in the near-term. UNII is $0.12 which is highly supportive of the distribution as well. ARDC put up another solid report and the distribution is very safe at this point. 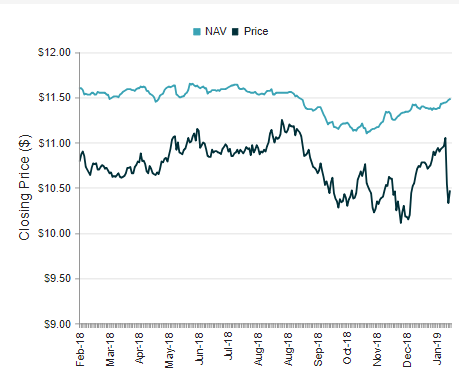 The NAV fell during the last two months of 2018 like all risk assets did with the NAV down 5.76% in the fourth quarter. We've seen a capitulation trade in the shares back on the 21st when the discount fell to 20%, from 14% the week before. The current discount is attractive still at 15%+ compared to the one-year average close to 10% and the 3-year average of 11.5%. The distribution yield is also very compelling for the risk at 9.3%. We would not hesitate to add to the position here. Stocks turned out some decent sized gains for the week but not without some fairly remarkable volatility. The week started off poorly with the worst Christmas eve going back to the 1930s pushing the S&P into bear market territory. Following the closed markets on Tuesday, Wednesday saw one of the largest point gains ever with the Dow jumping over 1,000 points on the day. The VIX hit a 10-month high of 36 before dropping back to 28 by the end of the week. Interest rates ended the week lower as money continued to flow out of equities and into safe haven areas of the bond market. The 10-year yield is down to the lowest level since March at 2.716%. The 2-year yield is down to 2.518% implying a far move dovish expectation from the Fed. On November 8th, the yield was over 2.96%. JPM Market update – stocks finished modestly lower following the last few days of gains, with the SPX down 3.1pts at the close. It was another volatile session in which the index spent the majority of the day in the red before a late-afternoon buying surge pushed it up as much as 1%, only to then come back for sale in the last hour of trade to finish in the red. Once again there wasn’t a whole lot of news our over the last 24 hours, and the price action was largely a function of broader market forces and investor positioning (pension fund rebalancing has been cited as a key driver for the market rally on Wednesday and the late-day rally on Thursday). The US government remains partially shut-down and there’s been no real progress towards a deal. The WSJ reported this morning that it’s increasingly likely for the shut-down to extend into January, and while this normally isn’t something that markets care too much about, it comes at a time when investor anxieties are high owing to a list of other growing concerns (i.e. the state of global growth, Fed policy, trade, and a White House in chaos). Looking into next week there are a few important items on the calendar that will provide additional clarity into the state of growth, including China’s NBS PMI’s for December on Monday morning, the US manufacturing ISM for December on Thursday morning, US auto sales for December on Wednesday morning, and the US jobs report on Friday morning. Economic data was mostly mixed with a very strong Chicago PMI but a plunge in the Richmond Fed Index. Consumer confidence dropped to 128.1 but still remains quite high. Lastly, holiday spending was strong topping last years record sales. The next couple of weeks should be interesting as we have a lot of economic data for December out plus people returning to work from the holidays. We'll be keeping on eye on everything. Final Liquidating Distribution Announced Today (payable December 28, 2018): $14.6555. Since BPK’s inception, the fund’s annualized total return on net asset value was 5.13% and the market price total return was 4.83%. Since BJZ’s inception, the fund’s annualized total return on net asset value was 4.54% and the market price total return was 4.25%. Since BLH’s inception, the fund’s annualized total return on net asset value was 4.47% and the market price total return was 4.17%. Discounts tightened a bit during the week thanks to some relatively calmer markets and likely a dearth of sellers. Some good signs are emerging as the PIMCO funds have seen some more significant discount tightening from being massively oversold. For example, PCI, which started the week at a 10.3% discount, ended the week at just 6.04%. Anytime you see 4% of discount tightening without any catalyst to do so, that is a major snap back. PDI also saw the same significant snap back, and then some. It started the week at a 0.77% discount, the lowest valuation that fund has traded in the last year. By the end of the week, it was back to a 7.17% premium. It was only 10 trading days but it felt like forever. That is often how bear markets and sharp declines work. The market is highly inefficient. 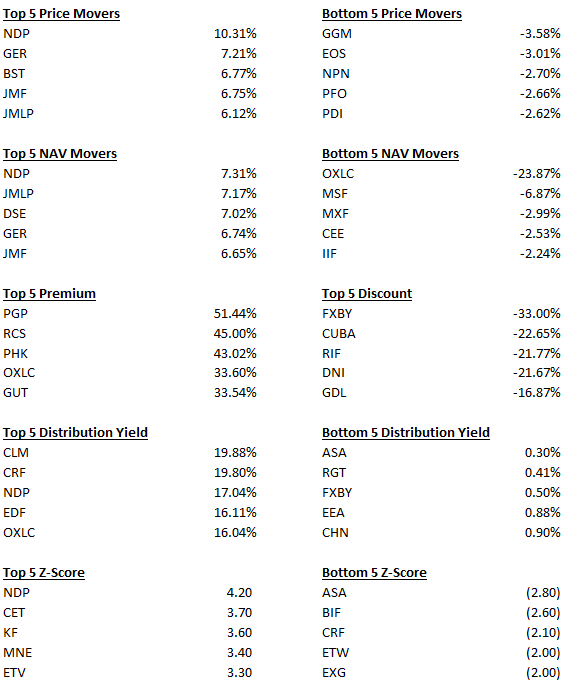 Check out some of these valuations and moves in the last few days. (and potential swap ideas). The inefficiency is especially acute in the Nuveen target term high income series. Yesterday, Nuveen High Income 2023 Target (JHAA), which recently IPO'd at $70M, rose 5.74%. This is a bond fund that has no business rising that much in a day. At one point, the fund was up nearly 20% and halted by the exchange. I highly doubt any members own this but if you did, please sell at a nearly 11% premium to NAV. The Nuveen High Income 2020 Target (JHY) is also now extremely overvalued. The shares are over a 6% premium for a fund that will liquidate in less than two years now (3% per year headwind to your return). The one-year z-score is +4.90. (SELL! SELL! SELL!). Conversely, you could go out one year to the Nuveen High Income 2021 Target (JHB) which trades at a 5.50% discount. It's one-year z-score is -2.0. This would be a GREAT pair trade if you could find borrow to short the JHY fund. Another swap idea is in the Invesco terms. Invesco High Income 2023 (IHIT)trades at a 1.6% premium with a one-year z-score of +3.0. Conversely, the Invesco High Income 2024 (IHTA) trades near a 6% discount and has a one-year z-score of -0.60. The NAV of IHTA has performed fantastic during this market swoon too- it's down only 5 cents during December. The fund was recently at $9.03 which is a bargain. There isn't a ton of liquidity so limit orders are a must- along with patience. Another fund to look out for would be PIMCO Strategic Income (RCS) which has bucked broader CEF trends and seen its premium increase over the last month. Holders of the fund may want to swap out into something like First Trust Mortgage Opp (FMY), at least until the valuation comes down. The exposures are not quite the same as RCS is 64% Agency MBS and 14% non-agency MBS, while FMY is almost exactly the reverse. RCS is currently attempting to change their tax reporting structure which may cause a cut to the distribution as well. We are finally seeing some things move our way. The Core model was up 3.55% during the week, a nice snap back though we need another week like that to get back to even on the month. Considering there's only one trading day left, it's probably not going to happen. Blackrock released their monthly EPS and UNII report for November. On the taxable side, we saw coverages generally slide a bit during the month. Nine of the twelve of the taxable Blackrock funds saw coverage decline in the month while UNII was more mixed. Blackrock Debt Strategies (DSU) saw coverage decline back below 97% for the first time since July. UNII is now at -2.42 cents, down from -1.8 cents in July. While the degradation is apparent, it is extremely slow at this point. Unless we saw a dramatic fall off in December given the volatility, it is unlikely that Blackrock will cut on Wednesday. Blackrock Limited Duration (BLW): A Core Portfolio fund, remains above 100% coverage for the fifth month in a row. UNII fell to 4.48 cents, from 4.65 cents. Blackrock Multi-Sector (BIT): This fund has been a bit of a conundrum and all over the place which could be due to the junkier/foreign assets held in it. BIT has 20% outside of the U.S. and now 10% below CCC, another 9% in CCC, and 17.3% in single B. This fund is far junkier then it was not long ago. Coverage is down to 85%, down 9.1% in the last two months alone with UNII down to -10.6 cents. We wouldn't be surprised to see a cut on Wednesday. Blackrock Credit Allocation IV (BTZ): This is the mirror of BIT with 70% in investment grade. This is another fund that has become "junkier" over time with now 11% in BB and even 3+% in CCC or below. While the coverage remains above 100% and has been flat, along with UNII, just understand that leverage is up a bit and junk up a lot over the last year. On the muni side, things held up will in December with the average national muni fund coverage at 109.81%, virtually unchanged from the month before. However, over a 3-month period, coverage is down about 3.5% from 115.8%. UNII figures were down slightly to +5.2 cents from +5.6 cents last month. This breaks the string of 3 straight months of UNII improvement. Looking at the aggregate figures for all funds tends to give a good idea of the health of the funds and sector in general. Most muni funds across the same sponsor tend to look similar- with similar holdings. We will have a full muni update in the next ten days following distribution announcements next week. Nuveen also released their monthly numbers for November. On the taxable side, the story is the floating rates which continue to show increased coverage ratios. JSD increased to 105.7%, JRO to 109.5%, and JFR to 109.6%. JQC, which recently instituted a capital return plan (mentioned in last week's weekly) has coverage over 111%. UNII on the funds also improved though four of the five are still below zero. The preferred funds also saw coverage improvement as interest rates declined and current yields in the preferred space look compelling. Coverage remains near 100% and UNII is improving overall. A fund that may be at risk for a cut is the taxable muni fund, Nuveen Build America Bond (NBB). The fund was recently merged with NBD, a similar strategy fund. UNII on the fund is now -7.8 cents. If any fund on the taxable side were to cut next week, we think it could be NBB or JGH. Nuveen Global High Income (JGH) saw coverage fall to just 96%, from 100% the month before and 102.2% in September. UNII has been improving, however, but that may stop soon. All in all, we do not see a ton of risk of cuts on the Nuveen taxables unless trends have continued in December and management sees a reasonable expectation of that trend continuing for some time. On the Nuveen Muni side, coverage remains strong with the average national fund at 104.2%, up slightly over October. On the UNII side, the average national fund is on the verge of breaking below -1 cent for the first time since May 2017. This would be a great step forward for these funds as they've struggled over the course of the last year. Again, we will have a full update on the muni side coming out shortly. This past week, MFS Municipal Trust (MFM) released their annual report through October 31. The reason this is important is that their "high yield" muni funds are all relatively similar but MFMs fiscal year end date is a month prior to MFS High Yield Municipal (CMU) and MFS High Income Municipal (CXE). This is similar to Pioneer which has two similar municipal funds that have a one-month offset in fiscal year -end. We reported on that (MHI) vs. (MAV) last month. While we plan to update the entire muni space in about a week, we wanted to focus on these funds in particular because they look especially compelling. Below is the updated portfolio breakdown for MFM based on credit quality. While it is a high income fund, it does have 78% of the total assets in investment grade, plus another 60% in either non-investment grade or not-rated. *A quick sidebar here, in the muni space, unlike the taxable bond space, just because an issue is unrated doesn't necessarily mean that the bonds are "junk". But often small municipalities do not want to pay to have their bonds rated (it is not economical) and they know they will not have a problem selling them at an appropriate interest rate. The duration of the portfolio is identical to the other high yield funds (CXE and CMU) around 9 years with similar average coupons. Below is the breakdown of the top 5 sectors of each of their muni funds. You can see that CXE, CMU, and MFM all have hospitals as the top exposure industry. The fund outperformed the muni index (Bloomberg Barclays Municipal Bond Index) with a total return on NAV of 1.5% vs. -0.51%. Despite rising leverage costs, the fund did benefit from the use of leverage which is derived from variable rate muni term preferred shares. The fund does have a partial hedge on to reduce the duration of the portfolio through the use of futures contracts on the 30-year treasury bond. The notional value amounts to just $7.3 million and the contracts expire this month- it remains to be seen if they roll them. Net investment income in the period ending October 31 was $15,337,740 versus $16,175,979 last year. Net realized gains were also down this year to $118K from $2.4M. The fund earned 37 cents per share in net investment income and paid out 37 cents in distributions to shareholders (100% coverage). While realized and unrealized gains were lower again this year resulting in the lower NAV overall, ($7.10 vs. $7.36 on Jan 2). Net investment income, while trending slightly lower over the last five years, hasn't moved all that much [$0.41 in 2014, $0.42 in 2015, $0.41 in 2016, $0.39 in 2017, and $0.37 in 2018]. The financials of MFM look solid without the same amount of degradation that we've seen across other muni funds this past year. This bodes well for the other two "sister" funds CXE and CMU. For example, CXE today yields a hefty 5.86% distribution yield which, if in the top bracket, is equivalent to a 9.90% yield on the taxable side. Remember, the distribution is more variable- a trait of MFS closed-end funds. In other words, MFS adjusts the distribution more often to equate it to actual net investment income. This avoids the massive distribution cut that some CEF sponsors have had to do in order to right their ships. The current discount is exceptionally wide at 11.4%. We believe this is due to the fact that after not adjusting the distribution for 8 months, they have reduced the distribution two months out of the last three. The total of the two cuts has been 6.25% and for the year has been 10%. Over the prior twelve months, the fund has earned 3.1 cents per month compared to the current payout rate of 2.25. UNII is now over 4 cents. Contact Yield Hunting for this article. We will upload it within 12 hours. Contact Yield Hunting for this article. We will upload it within a few hours.